Talkshow is texting in public. Talkshow is a simple messaging app that allows you to text these things in public. 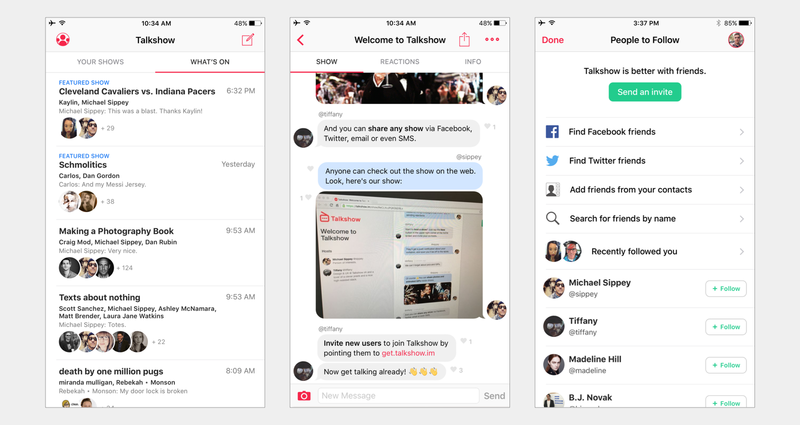 With Talkshow, individuals, groups of friends, entertainers, creators — anyone! — can have conversations in public, to be viewed by others in real time or after the fact. Every Talkshow can be shared outside the app and embedded into other websites. Talkshow is available today for iPhone and iPad and we can’t wait for people to download it and start hosting their own Talkshows. 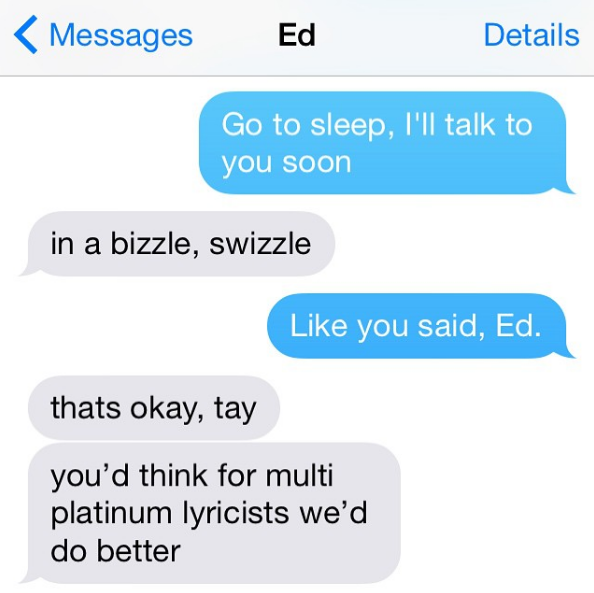 People have been screenshotting texts and posting them on the web for years, but it was this Instagram pic Taylor Swift posted of a conversation with Ed Sheeran that pushed me toward Talkshow. This little exchange is funny, it’s personal, and even though Tay and Ed are multi-platinum superstars, their conversation is relatable. Why? Because everybody texts! And everybody texts about everything: sports, TV, politics, Beyonce’s Lemonade, Damn Daniel, or what they’re eating for dinner. I wanted to create Talkshow to give people a platform to share these conversations in front of an audience. Talkshow is a messaging app (available for iPhone and iPad) that lets people have conversations with their friends in public. When you download the app and register, you can find friends on the app via Twitter, Facebook and/or your address book and start following them to find out when they’re hosting shows. You can also invite your friends to co-host shows with you. Starting a show is as easy as sending a message — just pick your co-host(s) and choose a title for the show. They will get a push notification letting them know they’ve been invited to co-host your Talkshow, and then it’s show time. It’s easy to share pics and GIFs in shows and use third party keyboards to post stickers if that’s your thing. Audiences can discover shows from the home screen of the app (we’ll be featuring great shows to bump them up to the top). As they watch they can like individual messages, share reactions and even send a request to become a co-host. We’ve been beta testing for a few months with a small group of people from different backgrounds. Now we’re opening the app up to everyone, and we can’t wait to tune into more conversations from a wide variety of people and voices. Head to the App Store to download the app and start texting in public. Questions, comments, feedback? Hit us up on Twitter, Facebook or email us at hello@talkshow.im and we’ll get back to you as soon as we can. Want to read more? Check out our FAQ here. News and updates from Talkshow, where you can text in public and enjoy great conversations.